Learn at your own PACE and have FUN at the same time! The Special Skills Academy offers language learning through the GOLDEN KEY learning method which includes e-learning instructors support, software and certifications. The Special Skills Academy stays consistent with its mission to help people build special skills in effective ways. There’s is no exception with language learning. You will have the opportunity to learn a language and effectively develop another special skill for career advancement. WHAT IS DIFFERENT IN THE GOLDEN KEY LEARNING METHOD? The GOLDEN KEY learning method actually teaches you how to learn language(s) using a unique approach. This is a crucial difference and exception comparing to typical language learning approaches. The initial knowledge acquired by language learners is what’s important when learning any foreign language. You choose the time and place of the language proficiency examination. Exam location: You can learn a targeted language, choose to take the proficiency examination and receive a certification through the Special Skills Academy, or you can learn the language through Special Skills Academy and take the final language exam through a IELTS, TOEFL, TOEIC, ESOL or similar exam center. Dates of examination: Whenever you are prepared to take the proficiency examination, you can contact us to schedule an appointment. Based on your language knowledge at the moment of the examination, you can acquire a language knowledge certification in one of the following levels: Beginner, Elementary, Pre-Intermediate, Intermediate, Upper-Intermediate, Advanced, Proficient. From day one, you'll navigate through the new language learning environment without the influence of your native language. Utilizing this method challenges you and radically increases your chances of learning the language successfully through deep memorization of key words and phrases. The GOLDEN KEY approach clearly shows that "bombarding" language learners with too much information and "rapid learning methods", that combine listening, reading, speaking and writing, is the wrong way to learn a new language. We are very surprised about the fact that modern language institutions rarely recognize this fact. The GOLDEN KEY approach has proven to be a stable and fast method depending on how much the language learner concentrates on written words. Systematically, you can learn a foreign language in a practical way through researching written texts (with a dictionary and grammar book) and correspondence with your instructor. This example fully shows the discrepancies with traditional language learning methods. Learn more about the GOLDEN KEY language learning method here. "If a driving school would teach us about all the elements of dynamic driving, for example how many millimeters are needed to press the gas pedal for an inclination of 30 degrees, how to change the gear shift from third to second speed, how many millimeters are needed when the point in question is an inclination of 35 degrees, how many centimeters we should approach the right curb of the road when someone is overtaking, and similarly, we would be opposed to such tedious and futile training. Really, don’t you think that drumming in grammar from various lectures and textbooks is not only hard, but also futile...?" Focusing on the written method has great advantages from the start. Avoiding "bombarding" decreases confusion and utilizing the repetition method naturally pushes language learners to naturally retain information. We know that students often prepare for an examination by writing information and studying that information repeatedly. This is an effective way to learn a new language. In language learning, it is more important to deeply retain the words and phrases, be able to say words with self-confidence and do this without a big emphasis on the accent. Using a natural method that teaches a new language without your mother language translation means no more confusing grammar explanations or too much information that "helps you learn better". Additionally, every language learner can choose his / her own theme and learn the language in a selected area. This is especially useful for people who wish to learn a language for business purposes. A participant living in France who works in a bank wishes to advance in his career by promoting to Chief of Marketing at the main UK office. He learns the English language utilizing marketing management thematic and texts which includes words used in marketing management and a business office environment. A participant wants to work as a welder in Germany. He learns the German language utilizing welder’s construction site terminology. From day one, he will learn through written texts and rarely forget what he has learned. The examples above show how you can choose a theme and learn the language to advance in your career. 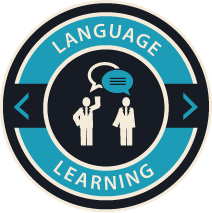 The Special Skills Academy offers language instructor support for basic guidance and advice. Remember that "touching the ball too much" in any sport causes complications; it is similar with language learning. Our language instructors have minimal "ball touch" to support you through written language learning. The written approach is fully compatible with e-learning methods and participants can learn a language anywhere at their own pace at a fraction of the average costs of other language learning methods. One of our primary goals is to get you to communicate in your new language with self-confidence. That is why you'll start speaking at the later stage of the language learning process. Polishing your accent and speaking are in the later stages of learning. Language learners can live and work in a selected country (usually after passing successfully the written exams), communicate over the Internet with people from the target country, watch movies in the select languages etc. Language learners are free to choose practice methods. When language learners are self-confident in the amount of words they have learned, then speaking the target language comes easy. The Special Skills Academy has its own unique software application that can help participants at the speaking stage too. The application can help you polish your speaking skills using speech recognition technology. Our special skills language learning software application listens to words recited into the microphone and in less than a second, recognizes what you've said, compares your pronunciation with a native speaker and gives you instant feedback! Using our software technology is optional; however, if you choose to do so, it can be used without the Special Skills Academy’s guidance. This is a complete language learning approach that works!